Ennahda’s failure to address Tunisia’s socio-economic challenges led to its electoral defeat, which may accelerate the movement’s split into a religious and political wing. Although a unity government between Nidaa Tounes and Ennahda would widen their internal divisions, for each party it is the best option. Talk of Tunisia’s elections has focused on parties and individuals, not issues, leaving many citizens unsure for whom to vote. Tunisia's draft constitution is turning into a text full of contradictions, reflecting the divided nature of Tunisian society. Ennahda has sought to engage Tunisia’s Salafi groups, but that approach has only undermined the party’s authority amid growing violence. In the midst of Tunisian unrest, Ennahda is struggling to address persistent legal, economic, and security issues at the root of popular discontent. In the aftermath of Morsi’s ouster, Muslim Brotherhood offshoots across the region seek to distance themselves from the “mother” organization—yet they all face the same fundamental challenges. Despite the rise of extremist threats, moderate Salafi groups have a unique opportunity to play a constructive role in Tunisia’s future. 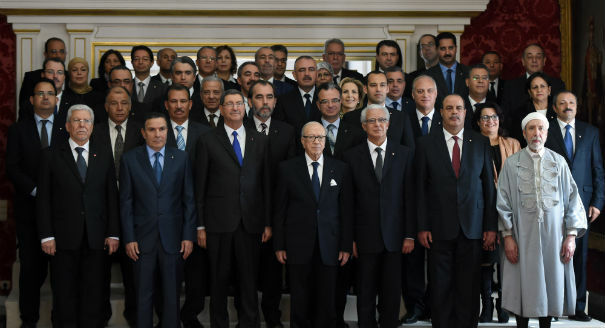 The politicization of justice issues in post-Ben Ali Tunisia threatens to obstruct the transition process. Challenging Ennahda in Tunisia’s next elections depends largely on the appeal of Nidaa Tounes to the center-left. Complex bureaucratic logistics and institutional inertias obstruct Tunisia’s security reform and the rule of law. Increasing polarization is threatening Tunisia's secular left. Pandering to the Salafis might seem a shrewd election strategy, but the party may be playing to a pipe dream. Tunisia’s broadly defined efforts to ban criticism of religion in Article 3 of its draft constitution are worrisome. Tunisia’s Salafis are newly licensed political participants. How have they done so far?